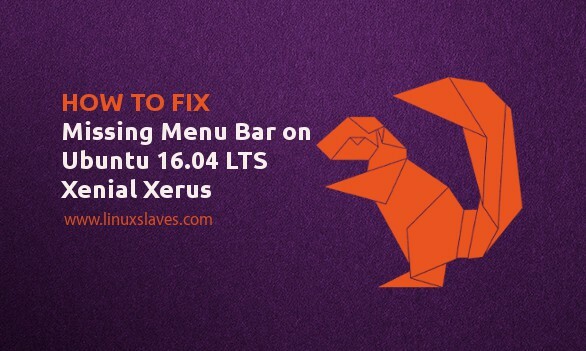 [Solved] Missing Ubuntu Menu Bar Missing - When Canonical releases Ubuntu 14.04, Trusty Tahr, there's a major change coming to the Unity interface. The standard since Unity's inception has been the global menus, similar to Apple's Mac OS X. In a nutshell, Global menu is a Ubuntu's feature that places the menu bar for each applications on the bar at the top of the screen. Canonical decided to put all application menus in a single location to give apps as much window space as possible. Yesterday, I found my Ubuntu 16.04 LTS Xenial Xerus menus for most apps applications such as Nautilus, Gedit, Gimp, Inkscape, don't show on the menu bar as it is configured in Appearance Setting. In addition, if I change the configuration to Show the menus for a window set to "In the window's title bar", they don't show either. Exceptions are Firefox browser and Thunderbird does have their menus on the menu bar. My friend has also experienced this issue. However, this is a reported bug that is being addressed with 'Confirmed' status because the bug affects multiple users by the developers bugs.launchpad.net. Now see it will restore the Ubuntu's menus. That's all I can write about how to restore missing global menu bar on Ubuntu. Hope this post can solve your problem. Thanks for visiting Linuxslaves!